Former England left-back Ashley Cole says he expects to retire from playing at the end of the season. The 38-year-old this week joined Derby on a deal until the end of the current campaign, linking up with Rams boss and former Chelsea team-mate Frank Lampard. Cole, who left Los Angeles Galaxy last year, is England's most-capped full-back, having played 107 times. 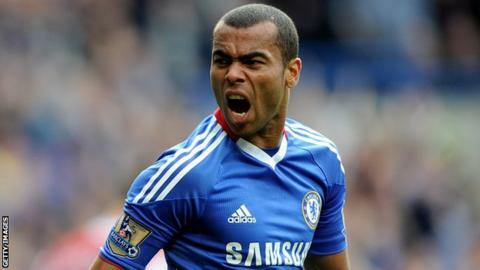 "Probably, after this season, it's going to be Ashley Cole finished," he told BBC Radio Derby. "I still love it, but the body can't handle it." Cole began his career at Arsenal, where he won two Premier League titles, three FA Cups and played in the 2006 Champions League final defeat by Barcelona before controversially moving to Chelsea soon after. He was part of the Blues side that won the 2012 Champions League and 2013 Europa League, as well as winning another Premier League title, four FA Cups and the League Cup. In 2014 he moved to Roma after his contract at Stamford Bridge expired and joined Major League Soccer's Los Angeles Galaxy 18 months later. "I thought after I left Roma that was kind of it for Europe," Cole added. "As I came towards the end of my career it was always in the back of my mind that I wanted to come and work back in England in terms of a coach, manager, whatever it might be. "I thought it was time to come back and start to work on a different way of life." Cole says he has always kept in touch with former Chelsea and England team-mates Lampard and John Terry, who is now assistant manager at Aston Villa. He says he has been impressed by what he has seen from Lampard's Derby since his friend took over as manager last summer. "I think he's doing a great job considering it's his first job," said Cole. "For me it was a no-brainer to come here and try and be involved in something big for Derby County. "It's a difficult league to come out of, so to achieve promotion would be a great achievement." Cole says he does not expect to walk into the Derby line-up and sees his role as being as much about helping the club's younger players as getting time on the pitch. "I'm not the same Ashley Cole as when I was 26, everyone knows that, so there's got to be a kind of expectation as well," he said. "I am 38, I've not played here for a long time, but it's more for the bigger picture of what I can bring to a team with young kids and morale for a team. "It's not just about how I can play."